Another reason I looove One Pot Wonders is the fact that no matter the recipe, it always tastes better the next day! It’s something about leaving it in the fridge to let the flavors combine so perfectly that just gets me. 1. ) Heat oil in dutch oven over Medium heat. Add garlic and cook about 1 minute, until fragrant. Add eggplant, mushrooms, green bell peppers, onion, zucchini and basil. Cook 5 minutes, stirring occasionally. 2.) Add tomato paste, crushed tomatoes and red wine. Turn heat to Medium-Low and simmer until veggies are cooked through and tender, about 20 minutes, stirring occasionally. 4.) Preheat oven to 350°F. 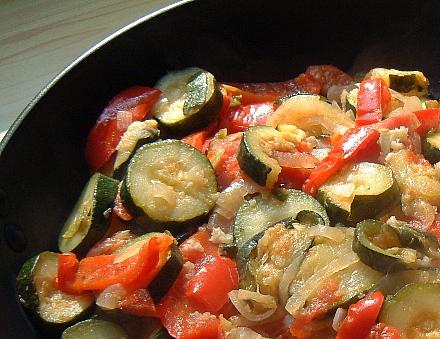 Spread ratatouille in 9-inch round or 8×8″ glass casserole dish. Bake about 20 minutes, until center is heated thru. Spoon onto plates. Top with goat cheese (optional). Serve. Other optional additions: Replace the chickpeas with shredded chicken or turkey. Add in a handful of chopped olives before baking.